Spain coach Vincente del Bosque has announced his provisional 30-man squad for the 2010 World Cup. There are a few surprise call-ups, notably for Barcelona starlet Pedro and Atletico Madrid’s 19-year-old ‘keeper David de Gea, who are both in with a chance of earning their first full international caps for La Furia Roja in South Africa this summer. The highly-rated trio of Victor Valdes, Cesar Azpilicueta and Javi Martinez are the three other as-yet uncapped players to make the squad. Goalkeepers: Victor Valdes (Barcelona), Iker Casillas (Real Madrid), Pepe Reina (Liverpool), David de Gea (Atletico Madrid), Diego Lopez (Villarreal). Defenders: Carles Puyol, Gerard Pique (Barcelona) Alvaro Arbeloa, Raul Albiol, Sergio Ramos (Real Madrid), Cesar Azpilicueta (Osasuna), Joan Capdevila (Villarreal), Carlos Marchena (Valencia). Midfielders: Sergio Busquets, Xavi, Andres Iniesta (Barcelona), Xabi Alonso (Real Madrid), Marcos Senna, Santi Cazorla (Villareal) David Silva, Juan Mata (Valencia), Cesc Fabregas (Arsenal), Javi Martinez (Athletic Bilbao), Jesus Navas (Sevilla). Forwards: Pedro (Barcelona), Dani Guiza (Fenerbache), Fernando Torres (Liverpool), Fernando Llorente (Athletic Bilbao), Alvaro Negredo (Sevilla), David Villa (Valencia). Pretty intimidating ain’t it? I’m particularly delighted to see call-ups for Pedro and Victor Valdes, who have been in superb form for Barca this season. 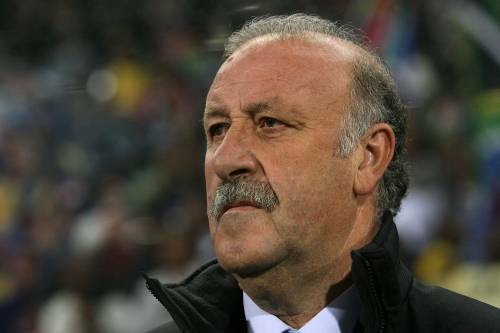 Del Bosque has the easiest job in the world. His hardest task will be choosing between Xabi Alonso and Cesc Fabregas. They should win it in a gallop. Apart from Busquets, who should live in everlasting disgrace, that midfield is rapid. Look at the strength in depth of their keepers. And their defenders. And their midfield. And their attackers. Basically, they’re gonna win the World Cup, beating Brazil in the final. If Llorente is cut, I will cry.